I managed to sneak another game in on Tuesday, though at this point its no longer considered sneaking as I’ve been doing it for months. I brought out Zaal, again, but probably for the last time in a while, as my Skorne days are dwindling and I want to get a few more casters under my belt. 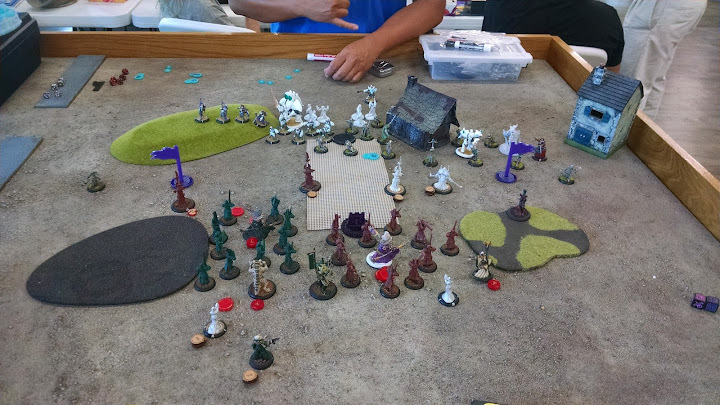 This week, I took on a newer gamer from our meta playing a 50 pt. Rhan list. Narn, Mage Hunter of Ios. His deployment held no surprises. The Stormfall deployed to my left to take the Hill, with both of the Battlemages taking front and center. Behind them were the Phoenix and Rhan. To the right were the Destor Thane and the Chimera. My depolyment was fairly standard as well, except that I decided to get Zaal over to my right hand flag. It had less of a presence of models, and might be able to be overpowered by my army. I figured that while the Mage Hunters could ignore the ARM bonus from Inviolable Resolve, the Krea Aura pushing my Def to 17 and ARM to 16 would be just enough, camping 2 fury, to manage anything crazy. One major adjustment I made to the deployment strategy, though, was to make sure that my Shamans were in the center of the Immortal Units, and that Zaal and the Krea were behind. I wanted to make sure that I made the most out of the paralytic aura bubble. His AD was normal as well, with Eiryss and one Mage Hunter Assassin taking the right flank, the Mage Hunters taking the center, and the second Mage Hunter Assassin taking the far left. My AD, as well, was extremely simple, putting Hakaar on the left, with a line of AG’s stretching to the left, about 5″ apart. As was his right and privilege from winning the die roll and choosing to do so, my opponent went first. It was simple, as all first turns tend to be, with 90% of his models running forward, taking positions to smash my army to bits on turn 2. The Chimera, Eiryss, and the Destor Thane ran around the building, but everyone else made their way forward. the Mage Hunter Strike Force received Polarity Shield, and Rahn put Forecfield on himself. For my part, I too ran most of my models, though a particular order was in place. The shaman on the left put up Paralytic Aura and charged the Phoenix. That immortal unit ran into position around the Shaman. The Far AG took the chance on the Mage Hunter Assassin rolling average to kill him and pushed out to the left. Hakaar and the right most AG ran forward, getting into position to wreak havoc. The Kovaas ran through the woods and stayed in them, just to make it a little difficult on any mages who managed to get in range, while still threatening anything that looked at that far flag funny. Zaal then went and put up Awakened Spirit on the right, put up paralytic aura himself, Soul Tapped to give all the AG’s their first soul, and moved over to the woods. Mage hunters wouldn’t care about the woods, but anything else is looking at def 19. The second Shaman did the same as the first, putting up paralytic aura for free with Awakened Spirit and charging. The Immortals, too, did the same on the right as the left, getting within the Paralytic Aura. The Krea, too, pushed out its aura and moved, mostly out of sheer luck, to cover the last few Immortals that weren’t in the Shamans bubble. The Soulwards then moved up, gave Hakaar his last soul, and got ready to dole out a second turns worth of souls if needed. Marketh, to further improve on the lot of the immortals facing the Stormfall archers, cast Inviolable Resolve on them, pushing their arm v. ranged damage to 21. Not to shabby. Finally, I ran my last AG right towards the battlemages. So, If you weren’t paying attention, I’d forgive you if you didn’t realize that I’m a moron. In the heat of the moment I forgot a critical part of Zaal’s gameplan, which is to use Ancestral Guardians to make more Kovaas, and while they are fairly durable, they can’t take the brunt of an entire army on their chin. He I forget where he started exactly, but I believe it was Rhan, who moved forward and popped his feat. He then used TK on Hakaar to turn him around and right next to a nearby AG. Then, forgetting about Steady, he forcehammered Hakaar. Thankfully, not all was lost and he spiked damage, doing 4 to the ARM 21 Character. Hakaar, however, went on to absorba Mage Hunter Assassin Charge, the Destor Thanes’s Quad Fire, which stopped on the third shot with snake eyes, Eiryss’ Sniper Shot and finally the Chimera’s combo Strike before crumbling into dust. 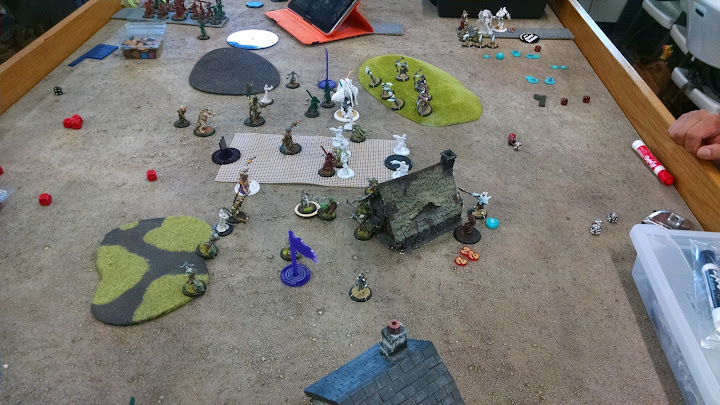 The center two AG’s were assaulted by the Battlemages and the Mage Hunter strike force, who also took out a few Immortals on the right, and they stood little chance. Even at dice-8 the battle mages are doing damage with every hit. 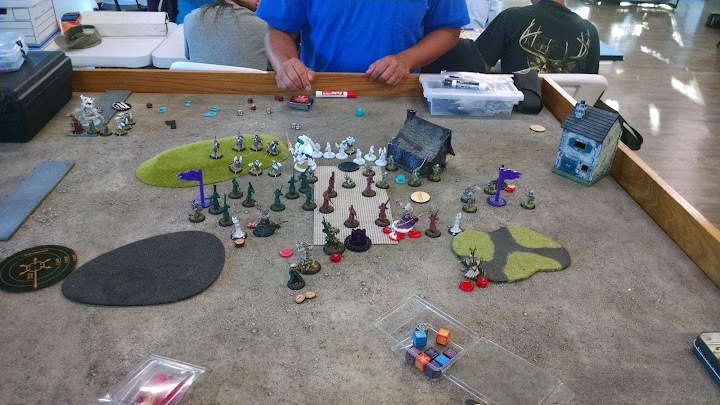 A few even managed to pull the Shaman on the left out of formation and nullify some of his Paralytic Aura. The Mage Hunter Assassin on the left, Aided by the Stormfall Archers, managed to take down the last of the AG’s, thus dashing my hopes for another Kovaas. All my hope was riding on the one deployed at the start of the game. The Phoenix moved up and took a retaliatory position. Finally, Narn activated and ran over to guard the flag on the left. This was gonna be a hell of a turn, I hoped. The Jade unit got vengeance moves, taking up positions to try and whittle down some of his forces, and I upkept Awakened Spirit. Pulling all the fury off the board, I was full up. The Kovaas had an easy job, and he went first. Seeing the Destor Thane flanked by Eiryss on the right and Narn on the left, I couldn’t help myself but to charge into the Destor and hope to destroy the master and pupil at once. Thankfully, all the dice swung my way and I was able to kill each in turn with the Kovaas’ thresher, gaining three soul tokens. Zaal went next, moving up to get in position to cast Last Stand on the Immortals and Cast Paralytic Aura, again, on himself. The Terracotta Immortals charged into the Chimera and removed it from the board with a model to spare who, having charged a different model, could now attack the Polarity Fielded Mage Hunter. The Jade Immortals, being spurred on by their bretheren, took the fight to the three Battlemages and the Mage Hunter Assassin. Man, I was missing the AG’s now. No Resonance made the Immortals charge a paltry 7, and their +2 MAT was keenly felt. Three Battlemages died, but the Mage Hunter Assassin lived on. At the start of the turn, I had hemmed and hawwed a little bit between using the Paralytic Aura offensivly, or to shoot at Rahn with the Far Struck Evil Eyes, and the Evil Eyes won out. Now, it was time to commit. The Shaman on the right used Far Strike on himself for free, moved forward and, through his line of troops and the objective, targeted Rahn. The dice favored me with an 11+ and the boosted damage roll sunk home, doing a few points of damage. The second shaman was a lot more risky in terms of range after sniping, so while I thought it over, the Raider moved up and gave Far Strike to the left Shaman, allowing both boosted hit and damage. I decided I was in range, aimed and took my shot. I was at about 13″, the dice rang true with an 11+ again, and the boosted 12 pulled up a few more pips of damage. The Krea and soulwards moved forward doing essentially nothing, and Marketh re-cast Inviolable Resolve on the Jade Immortals. I was done. I’m not the brightest cookie in the shed. Rahn was in a dangerous way, and he knew it. upkeeping Polarity Field, he moved off to the right, away from the Evil Eyesand toward the Kovaas. He peeked around the corner and tossed a Force hammer at the Kovaas, but thankfully, for me, missed. Sitting on the remaining three, he moved on. The Battlemages on the hill went next, pushing, pulling and creating this wonderful 5″ semicircle right in front of the Phoenix. The Mage Hunter Assassin on the left made an attack on the Cyclops Shaman, but managed to only get a few points of damage in, breaking his spirit. The Stormfall Archers tried to fire-bomb the Extoller, but missed due to the high Defense of the model. The Mage Hunters went and picked off shots here and their, killing two Immortals – Though one was a CMA, which I’ve heard is a terrible rule on the unit. The rest that were available took pot shots at Zaal, but he was having none of it. The Arcanist, brave as he is, charged into the Kovaas who did his best scary face to no avail. Abomination, it seems isn’t that big of a deal. The Phoenix went, next, and had a grand time Combusting on a huge swath of Jade Immortals, burning nearly all of them to death, and leaving the two that were alive on fire. His last activation was attacking my rightmost shaman with a Mage Hunter Assassin, who turned up snakes and left me just fine. I’d put a ton of fury out last turn, and I knew that I wasn’t going to be able to reave it all. I was hoping for a good frenzy check, but that didn’t happen. After pulling the Fury from the Shamans, who were integral to my plans, I was left with three on the Raider. He, surprising to no one, fails. He charges the nearest model in LOS, the Shaman, and punches him square in the head. The shaman takes an appalling amount of damage, leaving him with only a few points in mind. Zaal, however, went first after upkeeping Awakened Spirit and healed the injured Shaman the two points needed to return his body and spirit to full functioning order. He also used his feat, making sure to catch Rahn in it not because Rhan is affected, but because it makes getting the Kovaas to him and in the feat all that much easier. I measured for Last Stand to the Kovaas and was out by about 4″. I knew it, but I had to be sure. Next up to the plate, the Shamans, again, looking to bring home another Evil Eye win. Sadly, it was not to be. Unlike the turn before, I was unable to pull 11’s from either of the boosted shots. But, I still had the Kovaas, however, and he was getting into the caster. Sadly, when I declared the charge, my opponent didn’t know that he Kovaas went incorporeal again for free, at the start of my turn. He was an extremely good sport about it, however, and took the Charging, Feated, Kovaas with three souls to the face. It only took a single attack to put Rahn on his back after the two Prior Evil Eyes of yesterturn. We shook hands and I fled to DM my D&D game. He told me to get an “assassination” view. Who am I to deny it?